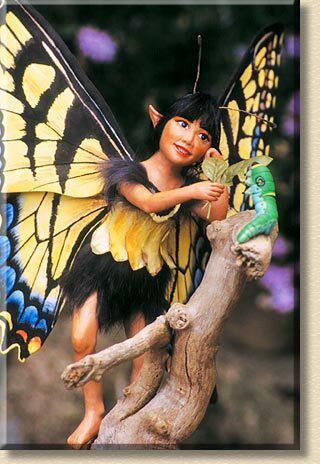 The lovely Tiger Swallowtail butterfly fairy feeds a leaf to a swallowtail caterpillar. .
Media: Our first Oriental figure. Head, shoulders, arms and legs of Super Sculpey, on a wire armature with a cloth body. She has straight black mohair. Her skirt and tiny sleeves are made of black rabbit fur, and her bodice is layers of yellow flower petals glued on one at a time. The wings are sewn from white cotton, then hand-painted like swallowtail butterfly wings. Props: She stands on a driftwood branch and holds out a leaf to the caterpillar, which is sculpted from coloured Sculpey III.